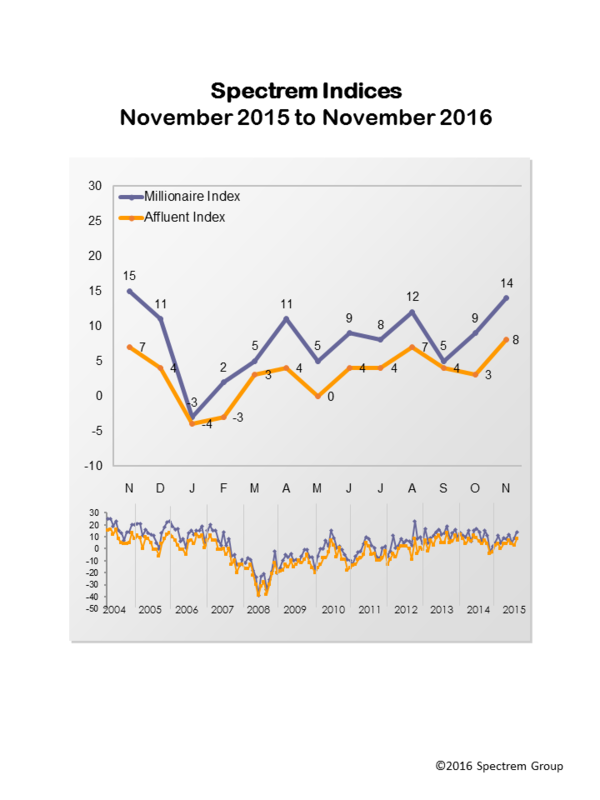 The post-election market surge and increased confidence in the economy helped lift the Spectrem Affluent Investor Confidence Index (SAICI®) and the Spectrem Millionaire Investor Confidence Index (SMICI®) in November. The November SAICI and the SMICI each gained five points from the previous month to 8 and 14, respectively. Each represents a benchmark level for 2016. The six-point gap between the SMICI and the SAICI is a return to historical trends that Millionaires have a more optimistic outlook than non-Millionaire investors. Political affiliation was a strong factor in gauging investor confidence. Affluent investors told Spectrem Group that news stories about the political climate most affected their economic outlook. In November the SAICI for Republicans was at 12, a gain of 14 pts. from October. The SAICI for Democrats was at 3, a drop of 6 pts. For Independents, it was at 12, a gain of 6 pts. from the previous month. The November SMICI for Affluent investors who identify as Republicans was at 21, a gain of 18 pts. from October, while the SMICI for Democrats was at 3, a drop of 14 pts. The SMICI for Independents was at 18, a gain of six points from the previous month. The indices are higher for Affluent male investors than they are for women. The November SAICI for males is 12, a gain of 9 pts. from the previous month, while the Index is at 0 for females, a drop of 5 pts. The SMICI for males surged 11 points in November to 18, but dropped 8 pts. to 3 for females. One of the drivers of the Spectrem Investor Confidence indices is the Spectrem Affluent Household Outlook, a monthly measure of four financial factors that impact Affluent investors’ daily lives: household assets, household income, company health and the economy. The November Spectrem Affluent Household Outlook gained almost 12 points to reach a 16-month high. It is up two points from the same period last year. While confidence in household assets and company health increased to three-month highs in November, confidence in the economy surged to its highest level since July 2015.